If you want to have a very special party, avail of catering services. They do in the movies, both on and off set. Have a holly, jolly Christmas! They certainly do in the movies. No matter what tragedies or mishaps befall them, movie characters always manage to, in the end, have not only a warm, insightful day, but a belly of fine food. Even on-set, but off-camera, Hollywood folks know how to eat. “Crafts Services” (aka caterers) on a movie or television set offer incredible, elaborate daily feasts. That’s right – daily fine dining. If that seems incongruous to the reed-thin wispy waists of actresses, that’s because it just is. For every day on set, the three women of “Friends” – Courteney Cox, Lisa Kudrow, and Jennifer Aniston ate what Cox designed and named, “The Big Salad.” They missed out on pasta bars, fresh-baked muffins, cakes and cookies, grilled steak and trendy taco trucks, amongst an array of meals mortals can only dream about. But here in Australia we too, can celebrate our Christmas parties much like those elaborate on-camera holiday food fare. Those delicious-looking scrumptious meal, laid out with china (never paper plates), real flatware (plastic is for picnics!) – are not only prepared but styled. And they really, really look good. 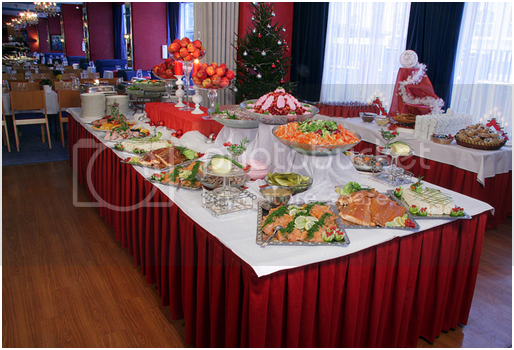 You should get to know who does their catering services. You never know, your next party might just be styled like Hollywood. “The Family Stone” (2005)– the entire movie takes place Christmas Eve and day, and features an epilogue of sorts on the same day, a year later. Nervous, uptight business-woman Meredith Monroe (Sarah Jessica Parker) meets her fiancé’s family for the first time. Antics ensue, but none so memorable as Christmas morning, when she’s ready to bake her much-hyped Morton Family Strata. Spoiler alert: it ends up on the kitchen floor and all over Meredith, but the bit opens the floodgate of female bonding. “Christmas in Connecticut” (1945) – Barbara Stanwyck (by all accounts, the nicest Hollywood star of the time) plays a single, fast talking, chain smoking New York food writer, who pens her popular column from her tiny, grimy Manhattan apartment. When the newspaper’s publisher arranges for a war hero to spend Christmas at the Connecticut farm she sets all of her articles, she has to scramble to put together a meal (and a family). She packs up, including her dear friend and chef Felix Bassenak (a wonderful S.Z. Sakall), who’s actually the source of all the recipes she writes about. Things get comically complicated when she falls for the war hero, who thinks she’s the happily married domesticated goddess. There’s a very elaborate Christmas Eve dinner planned, including roast goose, but it’s the smell of the only-in-the 1940s-is-this-credible sautéing kidneys that saves the day (and her job and budding romance). “Elf” (2003) – When adopted Elf Buddy (Will Farrell) prepares a meal for his bio dad (James Caan), it includes his new favourite food: spaghetti with maple syrup. Buddy is sure to include the elves’ four main food groups: candy, candy canes, candy corns and syrup. “A Christmas Story” (1983) – Each time the family sits down to dinner, they eat a typical mid-westerner’s German-ish dinner: meatloaf, mashed potatoes and red cabbage. When a neighbour’s dog eats the family’s Christmas turkey dinner, they end up at what’s probably the only thing open on Christmas: Bo Ling’s, a Chinese restaurant, where they eat duck instead. The U.S.-version of “The Office” – Nearly each year of the show’s nine-season run, they featured a (hilarious) Christmas episode. The show’s first holiday themed show, the second-season “Christmas Party” is too complicated to describe, but without a doubt, each Christmas episode is hilarious. One Christmas, male staffers take the low-in-himself over his love-life, boss Michael (Steve Carrell) to the Japanese novelty restaurant Benihana. Again, a must-see to appreciate. “While You Were Sleeping” (1995) – A lovely, sweet film about a lonely “L” employee who saves a man’s life, and spends Christmas with his family. I love all things Christmas! And all things food! Put those 2 things together: great food from great catering services and the most anticipated time of the year and you have a combination that’s more than perfect – It’s indeed a wonderful life! Their catering services is indeed good! By the looks, it is worth spending for. I hope we have that kind of services here in the Philippines. I wish I couuld afford a caterer for every occasion that we have, it would be stress free. catering services for parties is great but medyo magastos. Christmas is also my favorite season of the year, and one of the things I look forward to when Christmas comes is food, festive and delicious food!